Dean Hubert has been entertaining from a very early age. For the last 16 years he has been part of an award winning duo, Two Steps Forwar,d touring the club circuit in the north of England. 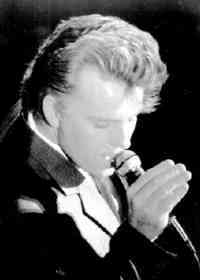 His music influences are Elvis Presley, The Beatles, Bobby Vee, Marty Wilde, the 50s & 60s era and of course Billy Fury. 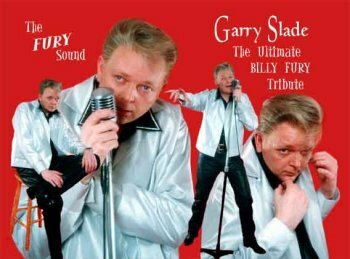 Through months of research he has put together the definitive Billy Fury package that emulates the style, look and feel of seeing a Billy Fury concert. He is married to Jane and they have two young children. Dean is a freelance web/graphic designer through the day and has also worked as a wedding and portrait photographer and as an extra in many popular TV shows. His interests include movies and film-making, PC repair, songwriting and comic collecting. Hear Dean sing Don't Jump. 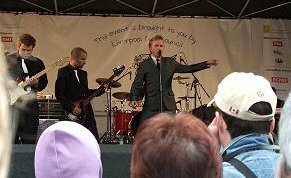 Gavin performed a tribute set at the Mathew Street Festival in Liverpool at the end of August 2009. This is an edited recording of his appearance the previous day on Spencer Leigh's show on BBC Radio Merseyside. Gavin has web space here. Picture courtesy of Jean Todd. 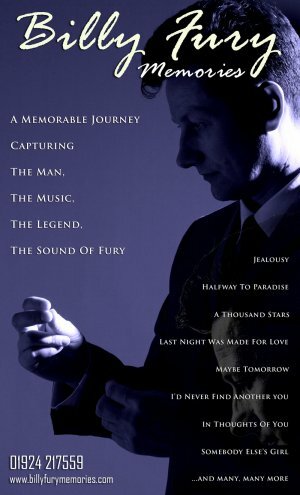 A tribute show, Halfway To Paradise: The Billy Fury Story, is drawing enthusiastic audiences around the country. The band are fronted by Colin Gold. He appeared on a television show, Stars In Their Eyes, in the UK, in which members of the public with a talent for impersonating personalities, are given a national audience. Gold sang Halfway To Paradise, and was seen by members of a group that backed Billy in the 1970s. 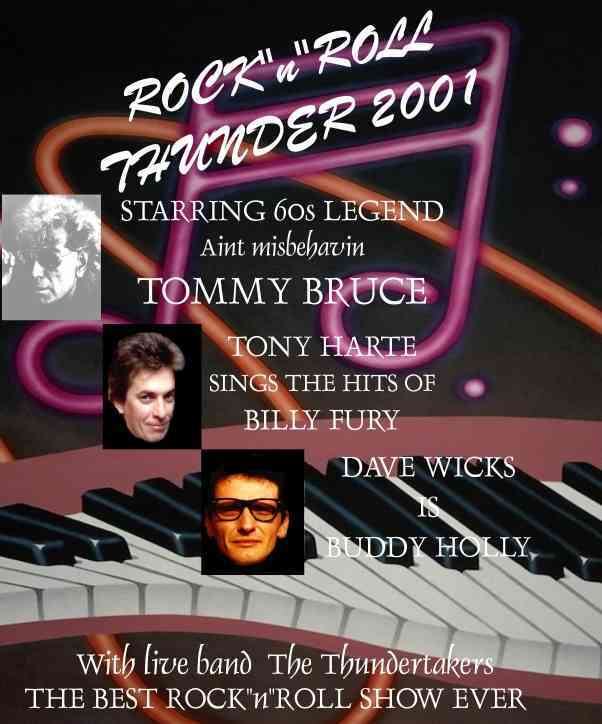 With a great deal of hard work, the band , who call themselves Fury's Tornados, have put together a creditable, exciting show, which is an impressive tribute to Billy. Their fan club can be contacted by writing to Shirley Bolton, 6 High Street, Eyeworth, Sandy, Bedfordshire, SG19 2HH, UK. The band also have a web site. Shaun Mather's review of one of their shows can be read here. Garry Slade's publicity flyer. I've seen this man rock and roll, and he is something special. Catch him if you can. Hear Garry sing Wondrous Place. Ray Shenton, a highly-experienced and versatile performer, has been building a strong and committed following. 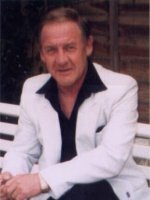 Hear his version of When Will You Say I Love You, taken from his CD Ray Shenton Sings Billy Fury. Johnny Storme was born in 1957 on the Isle Of Wight, where he still lives. If you'd like to form your own impression of John's talent, listen to the track below. Russ Dee was born in 1959 in Leeds, where he has lived all of his life. He is a painter and decorator, who often works away from home. He has since become a firm favourite at Fury events, featuring at Fury Fest 03, and at Sunnyside 05 and 06. The following track is from his live appearance at Sunnyside 06. 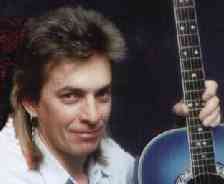 Tony Harte is also a Billy Fury song specialist. Tony fronts a revival package which tours the country, and I had the pleasure of a front row seat for one of their performances - more than two hours of superb entertainment. Catch them if you can. Click here for a copy of their poster. Dave Michael is an experienced singer/guitarist who has completed an excellent CD of Billy Fury/Elvis Presley standards. Dave is offering the CD for £6 through this site, of which he will donate £1 to the heart fund. Tracks are Treat Me Nice, A Fool Such As I, I'll Never Find Another You, I Will, Once Upon A Dream, Like I've Never Been Gone, Loving You and Treat Me Like A Fool. Click here to hear Dave perform I Will. He lives in Whitstable, Kent, and his act is 1950s-60s based, concentrating on Elvis, Buddy Holly and Billy. 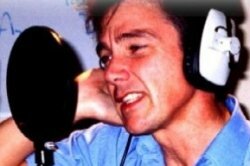 On 25 January 2003, he appeared on BBC Radio Kent to promote the Without You album and concert. Click here to hear him. To e-mail him, click here. Geoff Howlett's name will be familiar to everyone on the site. He's a very talented singer based in the Hull area, and I've had the pleasure of listening to some of his work. He contributed a fascinating interpretation of Do You Really Love Me Too to the Without You album. Geoff has sent me a copy of his own composition, Believe Me, which is his idea of a song that Billy might have performed in 2003. What a brilliant concept and what a captivating performance! Give it a listen. The Midnights, for long remained a mystery. 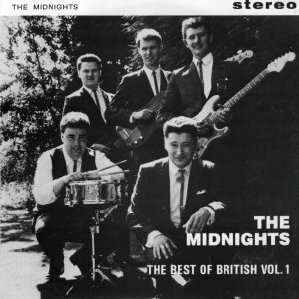 In 1966, they recorded an EP that featured a tribute to Billy, with a track that contained references to many of Billy's songs. You can listen to it by clicking here. They seemed to have disappeared without trace. Authorship of the tribute was credited to all of the group, John, lead guitarist Nigel Williams, Glenn Peterson (rhythm guitar and vocals), Steve Hewitt (bass guitar and vocals) and Steven Stovold (drums). The only other information that I had was that the lads come from Dagenham, Essex. Finally, after more than two years, I heard from the lead singer, John Marmara. Click here for the details. "There will never be anyone to match Billy's combination of stage presence, looks and distinctive voice. He was a one-off, as were Elvis, Gene Vincent, Little Richard and a few others. Without the efforts of these talented people Billy's profile would not today be as high as it is. For many years now, thousands and thousands of people have, for...perhaps a couple of hours, been taken back to their youth and memories of a performer who was such a big part...of our lives. I personally wish to thank every act I've witnessed so far, for taking me out of this humdrum existence and back to the 60s."